The Dead Zone is a 1983 American horror thriller film directed by David Cronenberg. The screenplay, by Jeffrey Boam, is based on the 1979 novel of the same name by Stephen King. The film stars Christopher Walken, Brooke Adams, Tom Skerritt, Herbert Lom, Martin Sheen, Anthony Zerbe and Colleen Dewhurst. Walken plays a schoolteacher, Johnny Smith, who awakens from a coma to find he has psychic powers. The film received positive reviews and became the basis for a television series of the same name in the early 2000s, starring Anthony Michael Hall. In the town of Castle Rock, Maine, John Smith, a young schoolteacher, is in love with his colleague Sarah Bracknell. After having a headache following a ride on a roller-coaster, Johnny politely declines when Sarah asks if he wants to spend the night with her. As he drives home through stormy weather, Johnny has a car accident that leaves him in a coma. He awakens under the care of neurologist Dr. Sam Weizak. He finds that five years have passed, and that Sarah is now married and has a child. Johnny also discovers that he now has the psychic ability to learn a person's secrets through physical contact with them. As he touches a nurse's hand, he has a vision of her daughter trapped in a fire. He also sees that Weizak's mother, long thought to have died during World War II, is still alive, and that a reporter's sister killed herself. As news of his "gift" spreads, Johnny is asked by Sheriff George Bannerman for help with a series of murders, but he wishes to be left alone and therefore declines. Sarah visits with her infant son and she and Johnny make out, but are interrupted by his father. Having a change of heart, Johnny agrees to help Bannerman and, through a vision at the crime scene, he discovers that Bannerman’s deputy Frank Dodd is the killer. Before they can arrest him, Dodd kills himself. Johnny is then shot by Dodd’s mother, who in turn is killed by Bannerman. A disillusioned Johnny, now barely able to walk, moves away and attempts to live a more isolated life. He takes on tutoring jobs for children, working from home until a wealthy man named Roger Stuart implores him to come visit his son, Chris. They form a friendship, but Johnny soon receives a vision of Chris and two other boys falling into ice and drowning due to wearing heavy hockey equipment during a game. Despite Stuart's skepticism, Chris believes Johnny and stays home from the game. The other two boys fall in the ice and drown, much to Stuart's shock. Johnny then realizes he has a "dead zone" in his visions, where he can actually change the future. Johnny attends a rally for Greg Stillson, a third party candidate for the United States Senate, for whom Sarah and her husband volunteer. Johnny shakes Stillson's hand and has a vision of him becoming president and ordering a preemptive nuclear strike against Russia that results in a nuclear holocaust. He seeks Weizak's advice, asking, by way of example, if he would have killed Adolf Hitler if he had the chance, knowing in advance the atrocities Hitler would commit. Weizak replies that he would have had no choice but to kill him. Johnny leaves Sarah a letter, telling her that what he is about to do will cost him his life, but that it will be a sacrifice he is willing to make. Johnny loads a rifle and takes aim at Stillson at a rally. His shot misses the target, but Stillson grabs Sarah's baby and holds him as a human shield. A photographer snaps a picture of Stillson holding the baby just as Johnny is shot by a security guard. Confronted by an angry Stillson, a fatally wounded Johnny grabs his hand. He now foresees Stillson's reputation and political ambitions being ruined; after the photograph of his cowardly act is published, Stillson will shoot himself. Johnny tells Stillson he is finished. Sarah embraces Johnny and tells him she loves him as he dies. As King's novel The Dead Zone was released in 1979, Lorimar Film Entertainment began developing a film adaptation. Producer Carol Baum gave the book to screenwriter Jeffrey Boam and asked him to write a screenplay. "I saw it had great possibilities and agreed to do it," Boam said. He developed a script with director Stanley Donen, who left the project before the film had reached production at Lorimar. 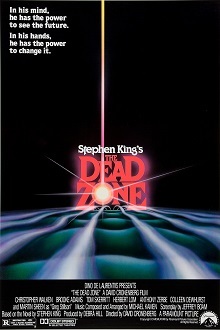 Lorimar eventually closed its film division after a series of box office failures, and soon after, producer Dino De Laurentiis bought the rights to The Dead Zone. He initially disliked Boam's screenplay and asked King to adapt his own novel. De Laurentiis then reportedly rejected King's script as "involved and convoluted"; however David Cronenberg, who ultimately directed the film, said that he was the one who decided not to use the script, finding it "needlessly brutal". De Laurentiis rejected a second script by Andrei Konchalovsky, eventually returning to Boam. The film was finally on track to be made when De Laurentiis hired producer Debra Hill to work with Cronenberg and Boam. Boam abandoned King's parallel story structure for The Dead Zone's screenplay, turning the plot into separate episodes. Boam told writer Tim Lucas in 1983, "King's book is longer than it needed to be. The novel sprawls and it's episodic. What I did was use that episodic quality, because I saw The Dead Zone as a triptych." His script was revised and condensed four times by Cronenberg, who eliminated large portions of the novel's story, including plot points about Johnny Smith having a brain tumor. Cronenberg, Boam, and Hill had script meetings to revise the screenplay page by page. Boam's "triptych" in the screenplay surrounds three acts: the introduction of Johnny Smith before his car accident and after he awakes from a coma, a story about Smith assisting a sheriff in tracking down the Castle Rock Killer, and finally Johnny deciding to confront the politician Stillson. Boam said that he enjoyed writing character development for Smith, having him struggle with the responsibility of his psychic abilities, and ultimately giving up his life for the greater good. "It was this theme that made me like the book, and I particularly enjoyed discovering it in what was essentially a genre piece, a work of exploitation," he said. In Boam's first draft of the screenplay, Johnny does not die at the end, but rather has a vision about the Castle Rock Killer, who is still alive and escaped from prison. Cronenberg insisted that this "trick ending" be revised. Boam submitted the final draft of the screenplay on November 8, 1982. King is reported to have told Cronenberg that the changes the director and Boam made to the story "improved and intensified the power of the narrative." Before Christopher Walken was cast as Johnny Smith, Bill Murray was considered for the role. Murray was King's first choice for the role. Cronenberg initially wanted Nicholas Campbell to portray Johnny, but the director wound up casting him as the Castle Rock Killer instead. Cronenberg also wanted Hal Holbrook to portray Sheriff Bannerman but de Laurentiis objected. The film was shot in the Greater Toronto Area and the Regional Municipality of Niagara of Cronenberg's native Ontario, Canada. The so-called Screaming Tunnel, located in nearby Niagara Falls, Ontario, was also used as the backdrop for one scene. The gazebo was built by the film crew and donated to Niagara-on-the-Lake. According to a David Cronenberg interview on the DVD, The Dead Zone was filmed during a relentless deep freeze in Southern Ontario which lasted for weeks, creating an authentic atmosphere of subzero temperatures and icy snow-packed terrain; which made for great natural shooting locations, in spite of it being almost too cold for cast and crew to tolerate at times. Canada's Wonderland, a theme park which is 30 km north of Toronto's city limits, was also used as a filming location. In an interview on the Dirty Harry DVD set, director John Badham said that he was attached to direct the film at one stage, but pulled out as he felt the subject matter was irresponsible to display on screen. The music soundtrack, composed by Michael Kamen, was recorded by The National Philharmonic Orchestra, London at the famous EMI Abbey Road Studios. Michael Kamen conducted the recording sessions; the orchestra was contracted and led by Sidney Sax. This is the only Cronenberg film since The Brood (1979) for which Howard Shore has not served as composer. The Dead Zone received very positive reviews on release. It holds a 90% approval rating on review aggregator website Rotten Tomatoes, which catalogs both contemporary and modern reviews. The site's consensus reads, "The Dead Zone combines taut direction from David Cronenberg and a rich performance from Christopher Walken to create one of the strongest Stephen King adaptations". Roger Ebert of The Chicago Sun-Times gave the film three and a half stars, describing The Dead Zone as by far the best of the half-a-dozen cinematic adaptations of King's novels to that date. He praised Cronenberg's direction for successfully weaving the supernatural into the everyday, and noted believable performances by the entire cast, especially Walken: "Walken does such a good job of portraying Johnny Smith, the man with the strange gift, that we forget this is science fiction or fantasy or whatever and just accept it as this guy's story." Janet Maslin of The New York Times referred to the film as "a well-acted drama more eerie than terrifying, more rooted in the occult than in sheer horror." The Dead Zone (TV series), a television series also based on the novel. "The Ned Zone", a segment of The Simpsons' "Treehouse Of Horror XV" episode that parodies the novel and film. "Ed Glosser, Trivial Psychic", a Saturday Night Live sketch featuring Christopher Walken that parodies the film. ^ a b c d e f g "The Dead Zone (1983)". AFI Catalog of Feature Films. Retrieved 2018-01-19. ^ "The Dead Zone". Box Office Mojo. Retrieved 2018-01-19. ^ a b c d e f g Lucas, Tim (Dec 1983 – Jan 1984). "The Dead Zone". Cinefantastique. 14 (2): 24–35. ^ Ferrante, A.C. (May 1, 2013). "Exclusive Interview: The Last Crusade of Screenwriter Jeffrey Boam". Assignment X/EON Magazine. Midnight Productions, Inc.
^ a b Collings, Michael R. (2008-08-30). The Films of Stephen King. Borgo Press. p. 91. ISBN 0893709840. ^ a b Wiater, Stanley; Golden, Christopher; Wagner, Iank (May 2001). The Stephen King Universe: The Guide to the Worlds of the King of Horror. Renaissance Books. p. 139. ISBN 1580631606. ^ Magistrate, Tony (2003). "Defining Heroic Codes of Survival". Hollywood's Stephen King. New York City: Palgrave MacMillan. p. 120. ISBN 0312293216. ^ Locke, Greg W. (26 August 2011). "The Top 25 Roles Bill Murray Didn't Take". Archived from the original on 25 November 2011. Retrieved 25 May 2015. ^ Evans, Bradford (17 February 2011). "The Lost Roles of Bill Murray". Archived from the original on 20 May 2015. Retrieved 25 May 2015. ^ "The Dead Zone". Rotten Tomatoes. Retrieved 2014-02-01. ^ Ebert, Roger (26 October 1983). "The Dead Zone". Chicago Sun-Times. Retrieved 14 September 2016. ^ Maslin, Janet (21 October 1983). "FILM: 'DEAD ZONE,' FROM KING NOVEL". The New York Times. Retrieved 14 September 2016.